I’ve actually seen Ett play twice now — the second time was at Martha, a fantastic café that has incredible food and lovely drinks, as well as bathroom graffiti by Yoshitomo Nara. 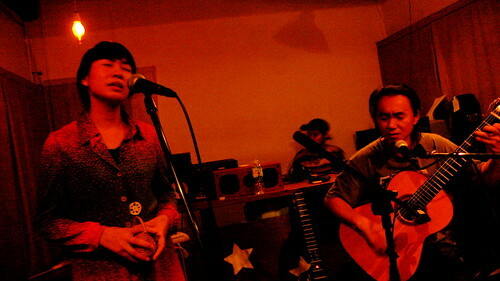 It was at Ett’s second show that I found out that Kei also runs Coup Label, an indie label based in Nagoya. 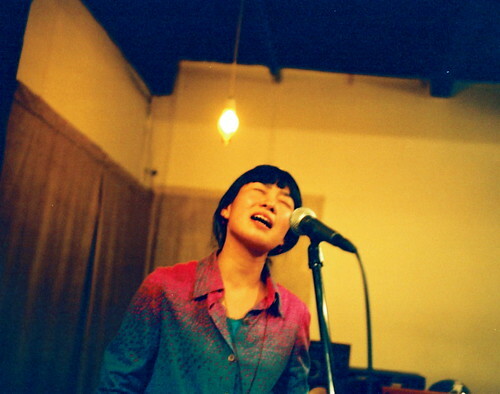 Coup Label’s offerings include a set of three incredible compilation CDs featuring artists from Nagoya. The cover art, which is stunning, is by Kei and features drawings that function as a kind of jokey insiders guide to Nagoya (Nagoya-jo’s famous pair of golden shachihoko are everywhere here), as well as a bright pink cut-out insert of Nagoya’s skyline. I think my favorite track from the 7586 compilation is an incredible electro-Dada vocal piece by ICHI that makes me want to move around like a crazy chicken. I’ve been listening to Ett’s second album, テンカラ (“Tenkara”), and it’s so good that it makes me really look forward to hearing their third album, which is due out sometime in February (I think). 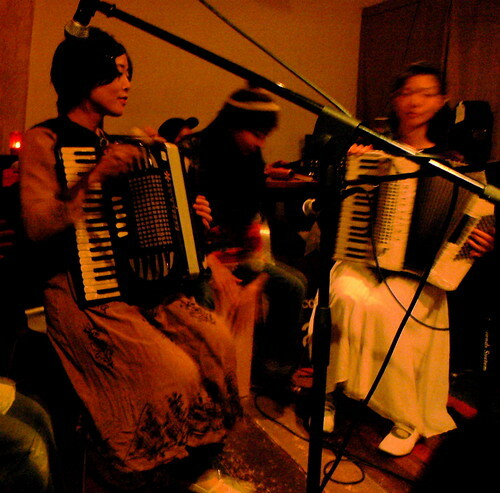 If I remember correctly, I think that Marié — who joined Ett for a couple of numbers at both shows — will be playing accordion on a few of the tracks, which sits just fine with me since Marié and Ett together sound so nice. I’ve tried hard to convey a proper sense of Ett’s music, but it’s really difficult to capture correctly. I might want to say that it has the feeling of walking down a country road, or that it might make you feel happy and childlike under the stars, or that it’s like a friendly insect, but all of these descriptions end up as misses. This is because, in fact, Ett’s music is made up of the kind of beautiful precisions that defy augury. Of course, Ryukusanburu Koen is a transliteration (from katakana and kanji) of the band’s Japanese name, which is リュクサンブル公園, or Ryukusanburu Park. I, of course, had no idea where this Ryukusanburu Park might be until Shinji-san, the owner of the Hartland, informed me that Ryukusanburu Koen was a “famous park in Paris.” Immediately I realized that Shinji-san was talking about Paris’s Luxembourg Gardens, where I was able to stroll for a few days back in the 80s when I visited Europe with my girlfriend at the time. It was towards the end of our trip, and we were pretty broke, so we bought baguettes, and Port Salut cheese, and some tomatoes, and a couple of bottles of cheap wine, and walked out to the park to enjoy our very cheap and very pleasant lunch. 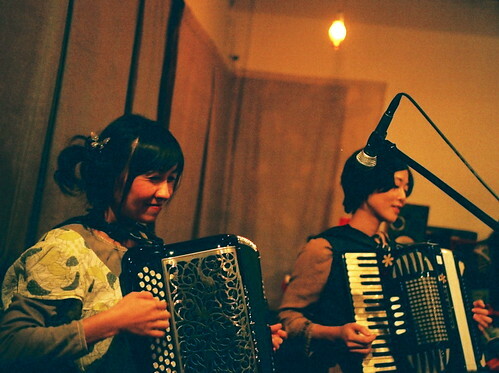 In any case, リュクサンブル公園 is named after Le Jardin, which explains their name, and the name of their first album (Le Jardin du Luxembourg). 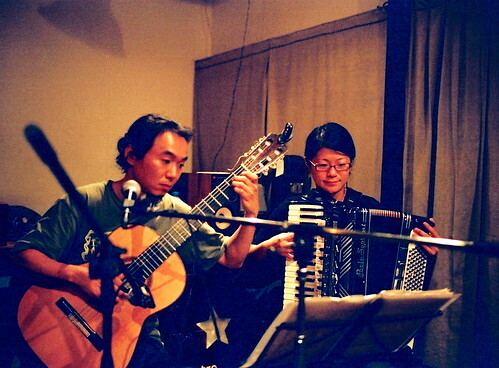 And in a strange turn of coincidence, it turns out that the reason Shinji-san knows about Ryukusanburu Koen is that his brother, Yuji Hirama, who is a member of the band Argyle, played percussion on Ryukusanburu Koen’s first album. But it wasn’t only music that made the night at Barbes so great — there was animation as well. I’m not sure if it was Chanky and Inunco together that were responsible for the animation, or just Inunco, but in any case there was a screening of “Shirokuma,” an animated short about a polar bear working in the circus (it guest stars a panda, and Arnie as the strongman). 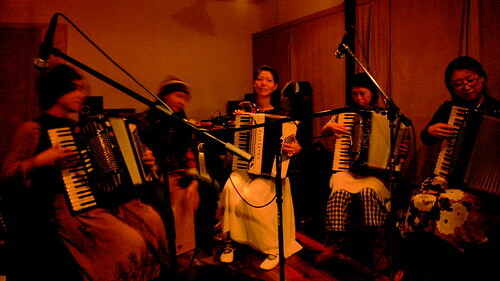 The animators narrated the film in a neo-benshi style, which added the delightful immediacy of performance to the cartoon, and members of Ryukusanburu used their instruments to create a mini-soundtrack. After the show I picked up a couple of mini-comics, including Inunco’s fantastic “Darumangiare!,” which is an insanely brilliant story about Daruma’s visit to Italy to learn about Italian cooking.